Mahalo to the original Bernice P. Bishop Museum crew who worked on the archaeological excavations and reconstruction of Ahu'ena Heiau platform and Hale Nana Mahina'ai at Kamakahonu. A special mahalo to Herb Kawainui Kane who drafted the original design for the reconstruction and to Mervin Gilliland of Amfac Communities Inc. who acted as the coordinator between the owners of the site at the time, Amfac, and Bernice P. Bishop Museum. Kona community members Sherwood Greenwell of Kealakekua Ranch, Kupuna Joseph Kahananui and Mr. and Mrs. Manuel Freitas also provided donations of materials and assistance. supervision of the heiau platform and associated superstructures, and of the Hale Nana Mahina'ai. walls to form an outline for th reconstructed platform. Actual fieldwork began on November 13. 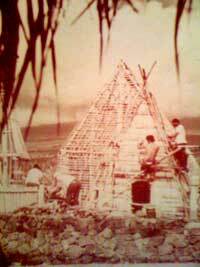 From December 15, 1975 to January 5, 1976 all four walls of the heiau platform were constructed to finished height, and archaeological excavation was begun. Dr. Yoshihiko Sinoto and archaeologist Tom Dye arrived on January 5, 1976 to direct excavation on the heiau platform and to locate Hale Nana Mahina'ai. and the platform was reconstructed. Collection of Building Materials for Reconstruction of the Superstructure Mr. Sherwood Greenwell of Kealakekua Ranch kindly donated ohia from his ranch land to the Ahu'ena Reconstruction Project. leaves. 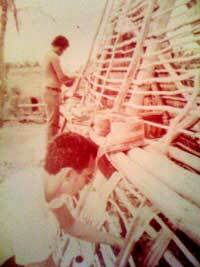 Mr. Julian Akao tied 15 to 30 leaves in each bundle, soaked them in brackish water, and dried them for thatching. This work will continue until approximately 250,000 ti leaves have been processed. The first two weeks of February were utilized for the collection and preliminary preparation of ohia timbers from Kealakekua Ranch for the reconstruction of the components of the heiau platform and additional structures. inches and up to 24 feet in length. The timber was debarked to avoid dry rot. Construction of the Hale Pahu was begun on February 17. This drum house was the restoration crew's learning vehicle. Twelve working days were used to complete this structure; each crew member participated in each phase of the construction. The reference for traditional notching and lashing of components is Russell A. Apple's The Use, Construction, and Adaptation of the Hawaiian Thatched House. Waiawi (strawberry guava) wood (donated by Mr. and Mrs. Manuel Freitas of Kona) was collected and debarked. For the roof of this structure, fire retardant prefabricated thatch was used. During this two-week period work continued on the structures. The crew erected three signposts in the reconstruction area. The signs were designed by David Roy and Herb Kane and describe the heiau platform, the Hale Nana Mahina'ai and the mortuary platform. A smooth stone-paved area forming a courtyard on the heiau platform was completed. It extends to the proposed fence line. All thatching purlins, both vertical and horizontal, have been attached to all structures. A total of 1,043 purlins was used. 433 for the hale mana, 107 for the anu'u tower, 125 for the hale pahu, and 218 for the Hale Nana Mahina'ai. Gordon MacKenzie donated a large breadfruit (ulu) tree, which was cut and planned to make door frames for the Hale Mana and the gabled Hale Nana Mahina'ai. All structures have been protected from insect damage by the application of Penta V.
each. Each square foot of the structure requires approximately 40 leaves. Thatching of the south, north and west walls of the gabled house has been completed, and the west half of the roof is covered. extract a red dye from kukui bark. The dark areas on the hale pahu will be covered with dyed lauhala leaves to simulate red lauhlala, which is no longer available in quantity in this area. Approximately 3,450 bundles of ti leaves have been applied to the Hale Mana. The door securing the entrance to the large gabled structure (Hale Nana Mahina'ai) has been placed in position. It is made of oiled heartwood of the ohia. The major effort for the past month at Kamakahonu has been towards the completion of the hale mana thatch. The crew lays on an average of 500 bundles or 8,000 leaves per day. Due to difficulties with suppliers, the crew collects its own ti leaves. One or two days per week has been devoted to collection depending on available supplies. over the ridge. The sheathing will be covered and held in place by fern ('ama'u) trim as depicted by Choris in 1816. 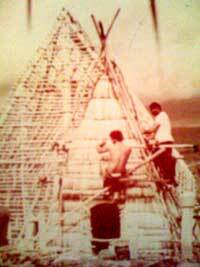 The anu'u remains unfinished until the tapa cloth is applied. When the structures have been completed the images must be carved to conform to Choris' original sketch. The reconstruction area at Kamakahonu has been completed. finished surface has a sculptured appearance. Ahu'ena Heiau now stands as it was once sketched by Louis Choris in 1816.